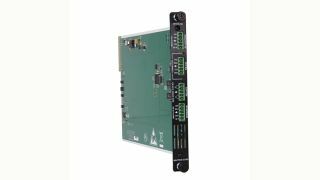 Neutron MT312-104 Control Card from Altinex The What: Altinex is now shipping the Neutron MT312-104 Control Card for use with the company’s MT302-201 Digital MultiTasker. The What Else: The Neutron MT312-104 Control Card provides control of both serial and IR devices. Additionally, there are two relays and two sensor inputs. The relays can be used to control external equipment such as screens. The sensor inputs are used to trigger events based on voltage levels supplied by motion sensors, heat sensors, light sensors, RF sensors, etc. The sensor connector also provides two voltages—+12VDC and +24VDC—for powering external sensors. The Neutron MT312-104 Control Card is capable of supplying information from third party controllers over ethernet port. Setup is quick and intuitive. By simply connecting to the MultiTasker enclosure’s IP address, one can easily check the status of the relays (open or closed), the input status of the sensor inputs (high or low) based on trigger level, or request RS‑232 data from devices connected to the RS‑232 ports. Adding to its versatility, the MT312-104 Control Card can store IR codes in its internal memory for direct control of external IR devices. Alternatively, an IR room receiver such as the Altinex AC301‑103 can be used to pass through IR signals from remote controls to devices connected to one or both of the controller’s IR outputs. Multiple control cards can be used within a single MT302-201 enclosure to enable nearly unlimited expandability and control of an AV system. The Bottom Line: Designed primarily for use with touchscreen control panels in today’s meeting rooms and presentation facilities, the new MT312-104 Control Card offers a wealth of ports for controlling a wide range of AV equipment.